Hello Everyone, 'Steve. What times sound check? Is it catering or buy out today?' Hang on. I've not woken up on the bus I'm in my own bed. Back in the real world having to fend for ourselves. The end of a tour is always a strange time as the musician gets used to living in the real world after living in a bubble for a month or so. I'm sure Attenborough could do a class documentary about it! So the tour. It’s been a brilliant one. Great fun to be back on the road with the boys. Too many highlights to list them all so I'll keep it brief. Best gig? 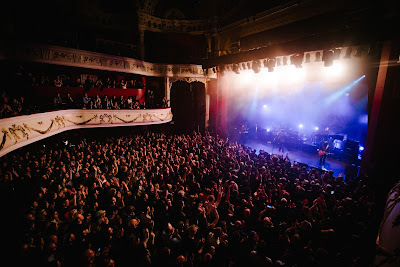 For me, Shepherds Bush Empire closely followed by Amsterdam Paradiso, the crowd was amazing in Manchester as they have been all through the tour but it all just clicked for us on stage in London. 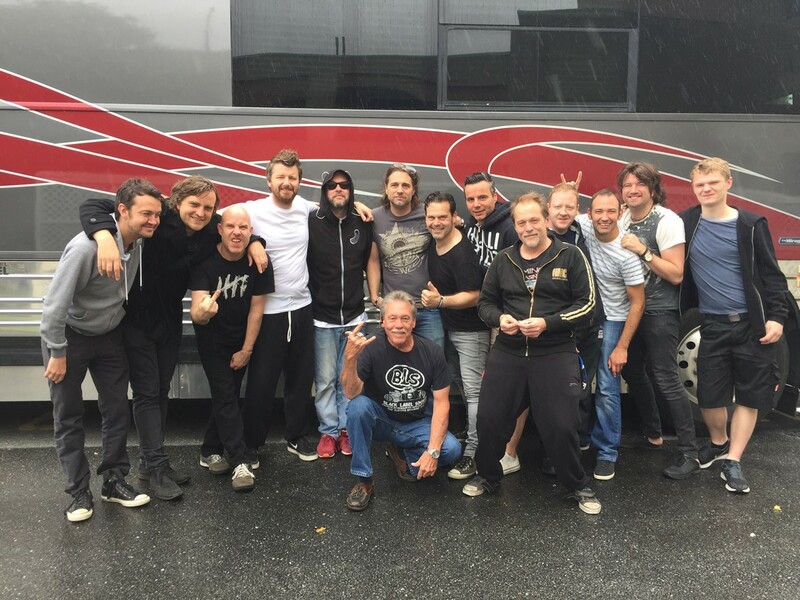 The perfect storm of a great venue and us being road worthy as the bus pulled in for the last UK date. The Paradiso was amazing too. We were flattered so many people travelled from back home to see us but the Dutch & folk from nearby Belgium & beyond did their bit to create a brilliant atmosphere too. Really enjoyed doing BBC Quay Sessions with Edith Bowman as well. It was nice to catch up with Edith who we've bumped into in many a muddy field over the years & sessions like this are always an opportunity to take the music to a wider audience who tune in online or on radio. Best food? It has to be the lovely chicken followed by our very own personalised tiramisu in Pratteln Switzerland. They know how to put a good spread on! Best support? Ha ha I'm not doing that. They were all brilliant. Kerri Watt who brought her country tinged soulful voice & did a brilliant job guesting on Lullaby. Up Down Go Machine who overcame smashing their van’s back window on the first show to deliver a rousing set of foot stompers every night they joined us. The Sherlocks who are all over the airwaves at the moment and proved just why as they delivered on stage every time, We Are Judas who's brilliant epic rock meant the crowd was treated to a fantastic triple bill on some of the date & Oliver Pinder who joined us in Leeds also added to a brilliant night bringing his emotional acoustic style. Not forgetting the bands that joined us on some of the European dates - Pablo Polar (Switzerland), Kensington Road (Germany) and Seed The Tree (Luxembourg) who were all great. So finally just a massive thanks to everyone who's helped put together & worked on such an enjoyable tour. GOOD SOULS: THE GREATEST HITS - OUT NOW! The album kicks off with the band’s three biggest hits in the shape of ‘Good Souls’ (#12), ‘Silence is Easy’ (#9) and ‘Alcoholic’ (#10). In addition to those tracks, the album features a further seven Top 40 hits, as well as deeper cuts such as ‘Tie Up My Hands’ and ‘Fidelity’ which became staples of the band’s live shows. 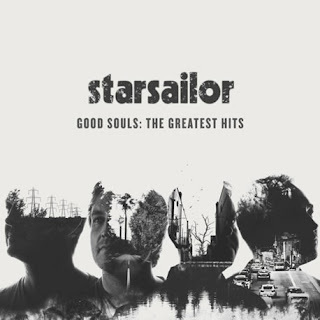 Starsailor’s initial run of success saw both their ‘Love is Here’ debut album and the 2003 follow-up ‘Silence is Easy’ hit #2 on the charts as they raced to a total of 3 million sales. Now their biggest hits and fan favourites have been collated in ‘Good Souls: The Greatest Hits’ which will be released on September 18th on Parlophone. The release of ‘Good Souls: The Greatest Hits’ follows the band’s reunion with a triumphant set on the main stage at the Isle of Wight Festival 2014. They subsequently toured as guests to James, before heading off to North American in 2015 for co-headline tour alongside Embrace. Completed by James Stelfox (bass), Ben Byrne (drums) and Barry Westhead (keyboards), Starsailor shot to prominence with the release of their debut single ‘Fever’. After an early NME live review drew glowing comparisons with Neil Young, The Verve and Coldplay, their 2001 debut album reached #2 shortly before they won the Philip Hall On award for best new band at the NME Awards and Best New Act at the Q Awards. The following year they were nominated for Best British Newcomer at the BRIT Awards. Starsailor recently announced their first full UK headline tour since 2009 which culminates with a London show at the O2 Shepherd’s Bush Empire on October 17th. The full tour schedule is listed on the tour page. We are very excited to announce a brand new UK tour in October. Check out all the usual agents or go to gigs and tours website and get your tickets now! So the dust has settled and the jet lag is lingering. Getting easier but still feels like I'm moving in slow motion in a full speed word. The last few gigs were fantastic. A fitting end to an enjoyable tour. Toronto was a particular highlight for me. The US crowds have been great, excitable, warm and welcoming. The Canadians (sprinkled with a few ex pats) found a new level that night though. The legendary Horsehoe Tavern was electric that night as the crowd spurred us on to the performance of the tour for me. Amazingly despite the searing heat in the venue they managed to keep the energy up and spur on Embrace too! New York was a good one too. We had a day off in Bowery before the show. Some of the Embrace crew hired bikes and rode the whole of Manhatten. We took a pilgrimage to Bleeker St (Where Dylan, Hendrix, Joni et al plied their trade) and the famous Cafe Wha? Then I had a a slightly boozy night with Richard McNamara and his New York resident brother in law. The next day hangovers dealt with it was onwards to Webster Hall for the show. It was daunting going on after Embrace for this one. About 50 Embrace fans made the trip from the UK and were cheerleading the remaining 400 or so people into a frenzy! We needn't have worried though there were some enthusiastic Starsailor fans too and the Embrace fanatics stuck around for us. We enjoyed chatting to everyone after the show and it was good to catch up with friends and relatives who are based over there now. The final gig of the tour was in Boston. As soon as we arrived we were greeted by fans looking for us to do a photo or sign an album. We're so grateful we still have passionate fans like that who have waited a long time to see us in their city. I must admit it was a little deflating to see a depleted crowd after such a busy gig in New York but the fans that were there absolutely fanatical for us and Embrace so it was a great show in the end. 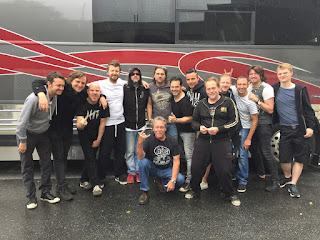 All thats remains to be said is thanks to Mike Hayes(US Agent)Steve Lyall (TM),Lez (TM),Beaver (Stage Tech),Tom (FOH & Monitors),Danny (Embrace),Richard (Embrace),Micky (Keyboards),Mike (Drums),Steve (Bass) and last but not least the inimitable Curt the driver for an unforgettable tour! Now where do we go next? We have just arrived in Shanghai for the first date of our tour of China and South Korea. Despite our jet lag we are looking forward to gigs in Shanghai tomorrow night (Friday), Beijing on Saturday and Shenzhen on Sunday before heading over to Seoul for our show on Wednesday 14 January. We hope to see you there!! !